We had got information from KPSC that there is a change in secretariat assistant exam. But even now there is no confirmation for it. 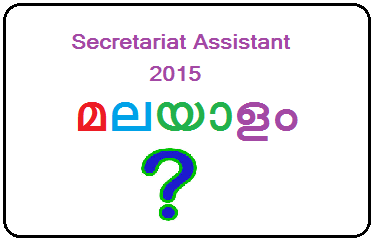 It affects the 5 lakhs of candidates who are preparing for secretariat assistant exam 2015. Candidates already had a complaint that they have no enough time for better coaching for the test due to immediate notification and exam. Now there is another complaint about syllabus. Before a few days, PSC informed that next secretariat assistant question paper will not contain any questions from Malayalam. Instead of that, more questions from history will include. But the candidates and others highly argued against this decision. The administrative language of Kerala is Malayalam. So the highest employees in the administrative sector - the secretariat assistants should have better knowledge in Malayalam. There is a complaint that PSC is planning to help the guide lobby and coaching centres indirectly. But we cannot believe it completely. Most of the candidates are waiting for the news about syllabus modification. Their request to PSC is that to publish the new syllabus for assistant/auditor secretariat as soon as possible and help them to attain their goal.